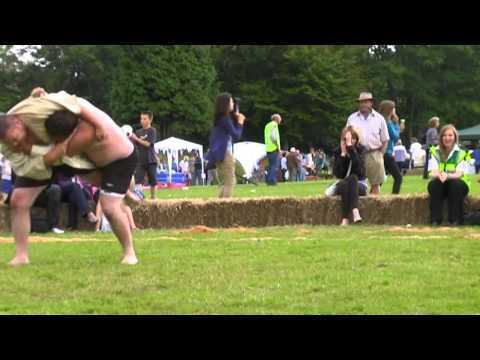 Info about "Cornish wrestling video"
Cornish wrestling is a form of wrestling which has been established in Cornwall (southwest Britain) for several centuries. The referee is known as a ‘stickler’, and it is claimed that the popular meaning of the word as a ‘pedant’ originates from this usage. It is colloquially known as “wrasslin” in the Cornish dialect. 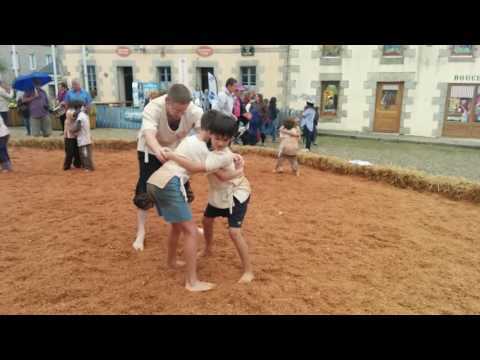 The wrestlers in the Cornish style both wear tough jackets enabling them to gain better grip on their opponent. All holds are taken upon the other wrestler’s jacket, grabbing of the wrists or fingers is forbidden as well as any holding below the waist. Although all holds are to be taken upon the jacket the flat of the hand is allowed to be used to push or deflect an opponent. 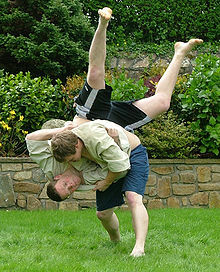 The objective of Cornish wrestling is to throw your opponent and make him land as flat as possible on his back. Three sticklers (referees) watch and control each bout whilst also recording down the score of points achieved in play. Four pins are located on the back of a wrestler, two at the back of each shoulder and two either side just above the buttocks. If a wrestler manages to throw his opponent flat onto his back, simultaneously scoring with all 4 pins they score four points in that single throw and this is called a “Back” to which the bout is then finished and the throwing wrestler is the winner. 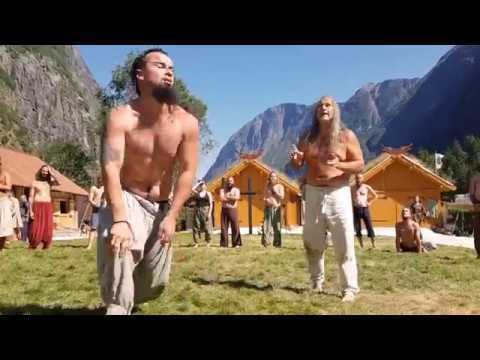 The sticklers will each raise their sticks when they perceive a Back has been achieved. If two sticklers raise their sticks but one does not a back is still awarded.